Fits the stern of many Wilderness Systems kayaks such as; Northstar Tandem, Alto, Cape Horn 15 and 17, some Sealution models but not all. May fit other kayaks outfitted with neoprene inner cover and a hard outer cover, such as the stern of the EMS Shearwater. Cover fits a hatch rim lip range of approximately 19 x 13 inches. (Old Wilderness Systems part numbers 3305-8100, 9800343, aka North Star Tandem Stern) This cover will come marked as Wilderness Systems #10. See the WS No. 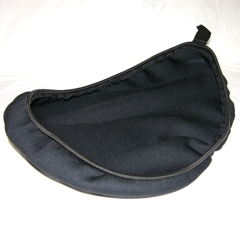 4 Neoprene Cover for an alternate fit to the stern hatch of the composite Sealution XL Model. Try the WS No. 9 Neoprene Hatch Cover to fit the stern of the WS Sealution II XS plastic touring kayak.